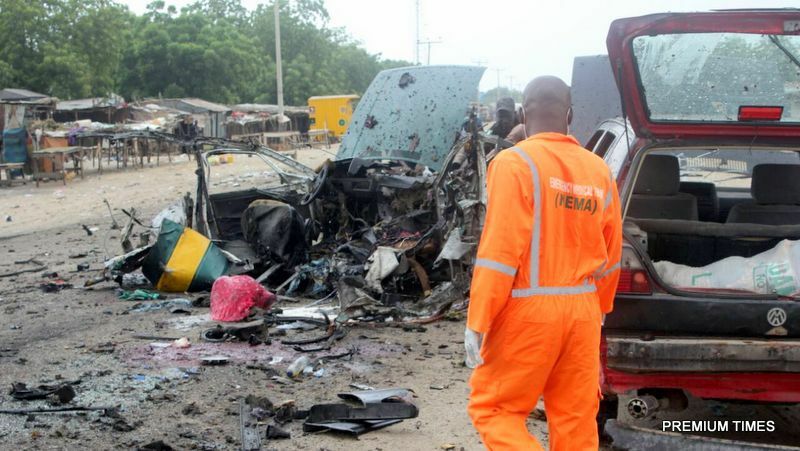 Four suicide bombers while attempting to enter the metropolis at Muna Zawuya village at the outskirts of Maiduguri, on Friday night ,at about 9:49p.m. were spotted by vigilante security operatives, military sources said. The security operatives reportedly fired at the bombers; three female and a male who exploded subsequently, killing themselves and one other. Borno Police Public Relations Officer, Edet Okon, in a statement, on Saturday, said 13 people were also injured in the multiple explosions. “At about 21: 49hrs yesterday (Friday), 30/3/18, four (4) female suicide bombers infiltrated Muna Zawuya village in Mafa Local Government Area in the outskirt of Maiduguri. They detonated the explosives killing themselves and one other person (female). “Thirteen (13) persons were injured and were taken to a hospital where they are responding to treatment,” Okon disclosed. He said the command had dispatched the Explosive Ordiance Department (EOD) and other unit to the scene to make the area safe for the people. “Normalcy has returned to the area. Meanwhile, adequate security arrangements have been emplaced for a hitch free Easter celebration. Patrol and Monitoring continues,” he stated.